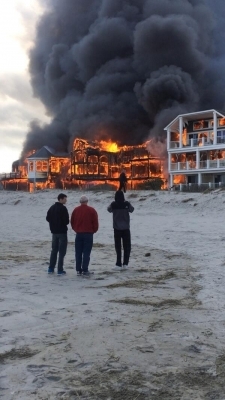 A large fire destroyed at least three homes along the beach in Sea Isle City, NJ late this afternoon. The fire started around 4:30pm at 78th Street at Pleasure Avenue on the beachside. The fire quickly engulfed the homes, spewing smoke into the air seen for many miles around. Fire crews were called from Sea isle, Avalon and Oceanview. The cause of the fire has not been determined. No injures have been reported. Unfortunately the homes were left raised to the ground by the fire. It is now under control. UPDATE: 5 homes were destroyed and 11 others were damaged by this 7-alarm fire in Sea Isle City today. Strong on-shore winds helped fuel the fire that quickly engulfed the town homes and left nothing but embers in the sand. The houses were unoccupied vacation homes. The cause is under investigation. A Philadelphia man has plead guilty today in Montogomery County for his role as ringleader in a scam that took $2.5 million from Comcast. 30-year-old Alston Buchanan is charged with corrupt organizations, theft of services and unlawful use of a computer. Buchanan employed over two dozen people in his enterprise. They would approach current Comcast customers with an offer to pay a one-time fee to have their bills reduced. Buchanan, a former Comcast employee, would then punch in promo codes on their accounts. The scheme was caught when one of his recruiters tried to solicit a Comcast employee who reported it to company security. Prosecutors hope for a lengthy sentence. Buchanan earned around $300,000 by changing 6,000 accounts over the past year. The Coast Guard, State Police, and local Bucks County authorities have been searching the Delaware River today for a missing boater near the Neshaminy State Park in Bristol, PA. At around 1pm Friday afternoon, the man was flipped out of his boat when his craft crossed the wake of a passing tugboat. They don't believe he had on a life vest. His boat drove in circles before running out of gas. As of now police are considering this a recovery mission due to the cold water and the time.